New Delhi/ Assam, December 3, 2018: Alarming footage captured by World Animal Protection and WildCRU (Wildlife Conservation Research Unit, University of Oxford) reveals the heart-breaking moment a pangolin is brutally killed for its body parts to be sold on the black market, in Assam, north-eastern India. The footage was captured by an undercover researcher on their mobile phone, and shows a terrified pangolin hiding from hunters in a hollowed-out tree clinging for life, as its tail is tugged. The hunters use axes to cut the tree, but failing to remove the desperate animal, they light a fire to smoke it out. As the pangolin starts to suffocate and lose consciousness it makes a bolt for freedom but is captured, bagged and taken to a hut where the next stage of the ordeal takes place. The pangolin is repeatedly bludgeoned with a machete until it can barely move. While bleeding, it is then thrown into a cauldron of boiling water possibly still alive, where its tragic struggle comes to an end. Pangolins are often referred to as the world’s most trafficked mammal and this footage demonstrates the huge cruelty the animals endure when hunted. The harrowing clip is part of a two-year study by researchers from World Animal Protection and the University of Oxford, into traditional hunting practices in the state of Assam, that borders Bhutan. Interviews conducted by researchers with over 140 local hunters found that pangolins were largely targeted for their scales that are sold for a premium, with hunters earning the equivalent of four months’ salary for a single pangolin. The hunters from these communities were clearly unaware of the part they are playing in the international trafficking trade. Yet the illegal traders that then sell the animal products across the borders on the black market go on to make a large profit. Pangolin scales are used in traditional Asian medicine particularly in China and Vietnam. Pangolin scales are made of keratin, the same material that makes human fingernails and hair, and they have no proven medicinal value. Pangolin meat is also considered to be a delicacy in some countries, and the scales are also used as decorations for rituals and jewellery. They are considered to be at high risk of extinction primarily as a result of illegal poaching. Reliable estimates of how many pangolins remain in the wild are lacking, although it is thought that over a million individual pangolins were taken from the wild between 2000, and 2013. There are eight species of pangolin, all of which are considered threatened with extinction on the IUCN Red List of Threatened Species. of CITES, the Convention on International Trade in Endangered Species of Wild Fauna and Flora, to which an annotation was added at the 11th meeting of the Conference of the Parties in 2000. This annotation established zero export quotas for wild caught Asian pangolins traded for commercial purposes. Despite these measures, both species of pangolins in India continue to be exploited for local consumptive uses and are frequently found in illegal trade, both domestic and international,” Gajender added further. World Animal Protection works tirelessly to prevent cruelty to animals around the world. Although it is well documented that pangolins are being hunted and trafficked, until now, the immense suffering and cruelty that these animals endure when they are hunted has remained relatively overlooked. · Support for alternative livelihoods, alleviation of poverty and education programmes within rural communities wherever pangolins are found globally, to stop the slaughter. · Read the full report on the cruel exploitation of wild animals here. This research represents an on-going collaboration between researchers from World Animal Protection and WildCRU University of Oxford. · Our study focussed on three of the predominant indigenous tribes of Assam State in Northeast India: (1) Biate; (2) Dimasa; and (3) Karbi. These tribes are characterised by unique traditions and cultures distinct from each other, and from other ethnic groups of the region. · Broadly speaking, subsistence agriculture or hunting and gathering are practiced by rural villagers belonging to all three groups. · Selling pangolins for commercial gain in India is illegal under Schedule I of the Wild Life (Protection)Act 1972. However, hunting pangolins outside of ‘Reserved Forests’ (i.e. protected areas) for personal use is not illegal for certain native tribal communities, such as the Biate, Dimasa and Karbitribal communities. This assumes (1) there is no contravening law made by the Regional Council on hunting; (2) the Council’s law prevails over the State’s law; and (3) the State Governor has not passed any law to restrict hunting. Nevertheless, the State Governor has the power to amend the laws of the Regional Council in any situation where conflict should occur. Hunting for commercial gain in India is illegal, although hunting pangolins outside of protected areas for personal use is not necessarily illegal for certain native tribal communities. In this study, many of the hunters were from tribal groups. the Chinese pangolin, Indian pangolin, Sunda pangolin and Philippine pangolin, which inhabit Asia, and the tree pangolin, long-tailed pangolin, giant pangolin and Temminck’s ground pangolin which occur in Africa. Dogs are man’s best friend. It is a said fact that humans have 5 million scent receptors in their noses, but dogs have up to 220 million. These millions of sensory scent receptors is what makes them so special. A dog’s brain is an expert for identifying scents. They even have an additional olfactory organ that is devoted just for detecting pheromones. The percentage of the dog’s brain that is dedicated to scrutinizing these scents is actually 40 times larger than that of a human! It’s been estimated that dogs can identify smells 10,000 times better than nasally challenged humans. Sniffer dogs, also known as detection dogs, are trained for using its senses to their utmost capacity. They are employed to detect illegal wildlife poaching products, explosives, illegal drugs, currency, or blood. Some sniffer dogs are used in drug raids to locate narcotics and individuals hiding from the police. These sniffer dogs are very useful even after their retirement. Their extraordinary abilities can be put to better use. These sniffer dogs can be of help to find and locate wildlife poaching activities. In the last ten years, Indian aurochs, the Indian cheetah, and the pink-headed duck have gone extinct. Animals such as the Ganges river dolphins, purple frog, the Himalayan quail, one-horn rhinoceros, and the Indian hornbill are listed in the critically endangered category. Many of the tiger reserves in India are depleting and that too due to tigers been poached for their skin. Tiger poaching is carried out in large numbers in India. Rhino horns are smuggled outside India in exchange for a huge sum of money. Elephants are killed in large numbers; leopard skin is highly valued and is hunted to make fancy leather wallets, handbags, fur coats, and jackets. Mongooses are poached and killed for hair, snake for their skin, tigers, leopards for their bones, claws, skin, and whiskers, rhinos for their horns, elephants for their tusks, the list is endless. Sniffer dogs are used to sniff out ivory and rhino horns as well as other illegal animal trade products. Illegal wildlife poaching in India is prevalent because of many causes. These sniffer dogs work in association with other NGO’s, government authorities and other agencies at various places such as wildlife reserves, airports, sanctuaries, nature parks, mountainous regions, forests, and wetlands. Unlike humans, they can withstand harsh climatic conditions and work round the clock. They can work with the same capabilities in rain, snow, heat, and other temperature fluctuations. However, in the dogs’ species as well, there are different breeds of dogs for different geographical locations. Breeds such as beagle, German shepherds, and bloodhounds have more scent receptors compared to dachshund and fox terrier. The climatic conditions in which they work also do matter. For example: German shepherds are used in locations that exhibit more heat. Also, these German shepherds have much more stamina to sustain that heat. In South Africa, dogs are trained for skydiving to catch poachers. The advantage that these dogs possess over police officials or other trainers is that these dogs can catch the criminals even after they have fled. All thanks to their olfactory lobes! I have just joined this club and as a volunteer to the Wild Life Crime Control Bureau, I am empowered to collect intelligence and pass on to the respective Dy Directors (North, South, East or West). I would appreciate members who have some cogent information to pass it on to me, without revealing your name or location ( for your own safety). "Staff of the tiger reserve worked hand in glove with poachers, while the state government kept its eyes tightly shut..."
India had large tract of forests, extensive grasslands, deserts and wetlands all prime ecosystems that supported vast array of wild animals, birds, butterflies and reptiles. The rapid increase in population and subsequent urgency for agricultural land and fuel wood resulted in destruction of our ecosystems. The demand for commercial wood and trophies all have contributed alongside to destroy nature and wildlife in India. Though much is still left, the wilderness now thrives in small pockets designated as protected areas -National Parks and sanctuaries. The protected areas were created to conserve keystone species like tigers and lion in India. The conservation efforts in the seventies and eighties resulted in comeback of most of the endangered species like the tiger, swamp deer, Indian rhino and Asiatic lion to mention a few. Project tiger is one such example which after initial success was unable to control poaching and forest destruction. The creation of tiger reserves was to accord additional protection. Unfortunately the increase in poaching incidence especially for tiger parts in China, skin in Tibet and elsewhere took its toll and still does. The demand created a nexus of smugglers, middlemen and poachers. The lucrative demand gave rise to poaching incidence even in the best protected tiger reserves like Sariska and Panna National Parks. In many incidences local communities are involved lured by a paltry sum. The most threatened species is the Bengal tiger. This charismatic big cat in spite of a major conservation efforts continues to be exterminated by the poachers in India. TakingSariska and Panna into consideration the administration and the law and order machinery appears to be helpless in nabbing and booking those involved in illegal wildlife trade. Tiger apart from being an important part of our environment is a National Heritage. Indian wildlife is diverse and unique. India is home to many endemic species as well. The country benefits from conserving its natural wealth and hence protecting the environment. If keystone species become extinct the damage to our environment will be irrevocable. The wildlife also attracts tourists from all over the World. The increase in eco-tourism brings in crucial funds. These funds are employed in conservation, economic upliftment of local communities as well as the tourism industry. The need of the hours is responsible wildlife tourism and tiger safari that promotes conservation. Tourism also brings into focus the understanding of the ecosystem and wildlife there in. Stringent laws that prevent poaching and destruction of our ecosystems are required urgently. The protected areas are created with conservation. But tourism should not be discouraged. The activity should be restricted and monitored. Neglected areas are more susceptible to poaching since the public eye is absent. Tourists along with local communities play an important role in conservation of our National Heritage. 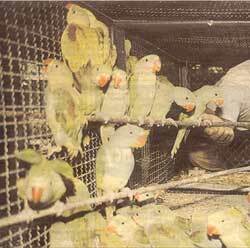 Rose-ring and Alexander parakeets are listed under schedule IV of Wildlife Protection Act. ( No person shall hunt any wild animal specified in Schedule, I, II, III and IV except when specifically authorised by Chief Wildlife Warden under exceptional circumstances). Seelampur in North East Delhi seems to be the "adda" for poaching these birds as several raids reveal. Houses of poachers here have permanent cages built into the walls. These cages are so tiny that birds develop wounds through constantly pecking at one another. After a recent raid of 150 parakeets, PFA(People for Animals) offiials said forty of the resued birds collapsed en-route to the Jain Bird Hospital. 35 healthy ones went to the police station. The fate of poached birds are sad, to say the least. Hear what a zookeeper has to say about these unfortunate ones! Historic Burning of Pelts in Srinagar - "The End of an Era"
Last week, (Dec 2007) Ashok Kumar in IFAW’s India office, lit the flames to a pyre of more than 127,000 smuggled pelts and skins of endangered species seized in India. One of the routes to the decimation of wild species has been shut down: The fur trade of Srinagar in Kashmir valley. The process began some years back in 1997. The time had come, late no doubt, that a licensed trade in garments made from skins and furs of wild species had to come to end. The carnage of a wide range of wild species over decades, if not centuries, can be guessed at by a mind boggling number of fur garments and skins declared by licensed furriers of Kashmir. The stock of tiger skins and garments alone tallied more than 89. In all, the stock of skins from wild species totaled more than 125,000. The tradition was age old, going back perhaps 200 years or more. Trappers and hunters of wild species in forests of the Indian sub-continent and the Himalayan range sold their `produce’ to a small town trader, who in turn delivered these to major cities such as Calcutta and the walled city of Old Delhi. The hub Gihara Gali later came to be known as Lane number eleven, the notorious wildlife trading alley. Actually, the word Gihara refered to a tribe of part time hunters turned wholesalers and taxidermists of wild skins and furs, who also supplied the Kashmir fur industry. The oldest case of the infamous wildlife trader, Sansar Chand, a Gihara, dates back to 1988 - he was accused of selling 29,489 skins to Kashmiri traders. The list of species seized in this case reads almost exactly as those now burned and included one tiger and five leopard skins. Jackal, wild cat and fox skins predominate. The case is still undergoing trial after 19 years. In 1978, Ashok Kumar had sought an appointment with Sheikh Abdullah, the Prime Minister of J&K state. He was also called Sher-e-Kashmir (the Lion of Kashmir). Fur garments were on open sale in his state, in Kashmiri owned shops all over India and in Nepal. He requested him to halt the carnage. His reaction was sharp: “mine is a tourism driven state, tourists from all over the world come to Kashmir, and they buy fur garments. That provides livelihood to my people.” No, it cannot be halted, he said. Two decades later, his son, Dr. Farooq Abdullah, Chief Minister of J&K was to approve the public burning of these skins. In 1986, the Central Government of India banned the trade in wildlife skins. The furriers took the government to court and succeeded in getting a “stay” order halting the implementation of the ban. As a result of NGO intervention in the court case, the stay was lifted and the ban came into force in 1992. Yet in Kashmir, this trade remained legal and licensed, since J&K state had a separate wildlife law. That law was brought on par with the Central Law only in 2002, which threw up the question, what to do with stocks of skins, furs and garments (some of which were considered to be legally held by licensed furriers)? To a committee appointed in 1997, furriers numbering 224 offered to surrender their stocks knowing a ban was imminent; an inventory was made and the value was determined. But where was the money, all of Rs.9.42 crores (US$ 2,400,000) to compensate the furriers? The Central Government refused to give the amount because that would amount to buying wildlife skins. The Central Government had already refused to do that for ivory traders and furriers in the rest of the country and their stand was accepted by the Delhi High Court in 1997 and upheld by the Supreme Court of India. The trickiest question was: should the government of J&K agree to compensate furriers? A move that could appear as if the state was buying wildlife articles, There was an impasse. A solution was proposed: compensation would not be given for the stock, but as rehabilitation grants to artisans. That opened a Pandora’s box because hundreds of artisans came forward to claim the grant whereas the furriers were traders and not at all artisans. The furriers then filed a case in the High Court of J&K in 2006 asking for the amounts promised to them when their stock was surrendered. The Court’s decision instructed the J&K Government to deposit the amount with the High Court, which would then release the funds to the 224 furriers. This process of paying compensation to furriers is ongoing and the stage was set for the burning of the furs and skins. At one stage, the temptation could have been to challenge - in the Supreme Court - the decision of the J&K High Court to compensate the furriers. There is little doubt that based on the Delhi High Court judgment of 1997 and upheld by Supreme Court, such a petition could have been admitted, halting the process of destruction of stocks. A more balanced view was that Rs. 9.42 crores was just money that could bury a gory past once and for all. Yet Kashmir, the paradise on earth, has its serpents. There is said to be as yet hidden, undeclared stocks. That story is beginning to unfold to be chronicled another day. The burning of many truckloads of fur garments and skins was started by J&K’s Wildlife Department on December 3, 2007 in Srinagar, Kashmir. Chief Wildlife Officer A K Srivastava observed that they had waited many years for this moment to arrive. I lit the first torch and lowered a tiger skin onto the pyre. As the flames leapt skywards, I witnessed history being made. Going up in flames was the largest single agglomeration of wildlife skins anywhere in the world. Wild species have respite from the Kashmir fur trade but there are newer challenges to wild species from the emergence of new markets in China. At no time can we give up the battle. World Pheasant Association WPA (India) proposed removal of the legal loophole in respect of dealing in peacock tail feathers, to the National Board for Wildlife, the apex national body for wildlife conservation chaired by India’s Prime Minister. The Board approved a rapid survey to assess the current status of the species and periodic monitoring and approprite protection measures in their meeting held on 19 June 2006. ‘Tiger Watch’ is leading a highly successful anti-poaching campaign around Ranthambore Tiger Reserve, led by Dr. Dharmendra Khandal, Field Biologist. Aditya Singh’s Blog on Ranthambore has more details of their recent raid.